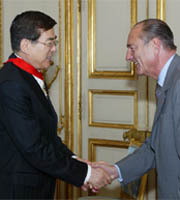 French President Jacques Chirac (left) confers the title of Commandeur in France's Legion DHonneur to Korean Air Chairman Cho Yang-Ho at Presidential Palace of Elysee on July 22, 2004. Korean Air chairman and CEO, Cho Yang-Ho received one of the highest civilian honors awarded by the government of France on July 22, 2004, Korean Air spokesperson announced the same day. Cho has been awarded the title of Commandeur in France's Legion DHonneur from the President Jacques Chirac of France in a special ceremony held at the Presidential Palace of Elysee on the day. In France, the title Commandeur is considered the most prestigious distinction civilians can possibly receive. La Legion DHonneur was created by Napoleon in 1802. As chairman of Korean Air, Korea's national flag carrier, and the Hanjin Group, a South Korea's global transportation giant, Cho has made great contributions to France and the Korea-France relationship. Currently he serves as chairman of the France-Korea High-Level Businessmen's Club. 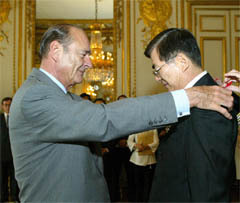 Korean Air Chairman Cho Yang-Ho (left) shakes hands with French President Jacques Chirac after he was awarded the title of Commandeur in France's Legion DHonneur by President Chirac at at Presidential Palace of Elysee on July 22, 2004. Cho was recognized by French government for bringing the two countries closer together. Cho has been serving as chairman of the France-Korea High-Level Businessmen's Club since 2000. He has played an important role in enhancing economic ties between the two countries. In addition, Korean Air on its part has been instrumental in creating one of the world's most successful airline alliances — SkyTeam — with France's leading airline, Air France. "I am extremely proud to accept this prestigious honor from the government of France. The relationship with France is a very special one that both countries have come to cherish," said Cho. "I will do everything in my power to make sure that it continues to grow in years to come." Cho follows in the footsteps of his late father, Cho Choong-Hoon, the founder of both Korean Air and Hanjin Group. Senior Cho received the same honor in 1982. The relationship between the Hanjin Group and France dates back to 1973 when late Chairman Cho was elected to head the Korea-French Economic Cooperation Committee. In October of the same year, Korean Air began to fly its first cargo jet between Seoul and Paris, making the route available for travelers in March 1975. In 1975, Korean Air became the first airline outside Europe to purchase aircraft from Airbus, French based global manufacturer of commercial airliners. Korean Air, with a fleet of 118 aircraft, is one of the world's top 20 airlines, and it operates almost 400 flights per day to 89 cities in 33 countries. 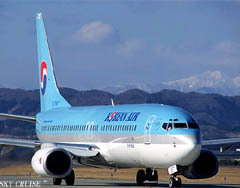 Korean Air is a founding member of SkyTeam, a global airlines alliance in partnership with AeroMexico, Air France, Alitalia, CSA Czech Airlines, and Delta Air Lines.